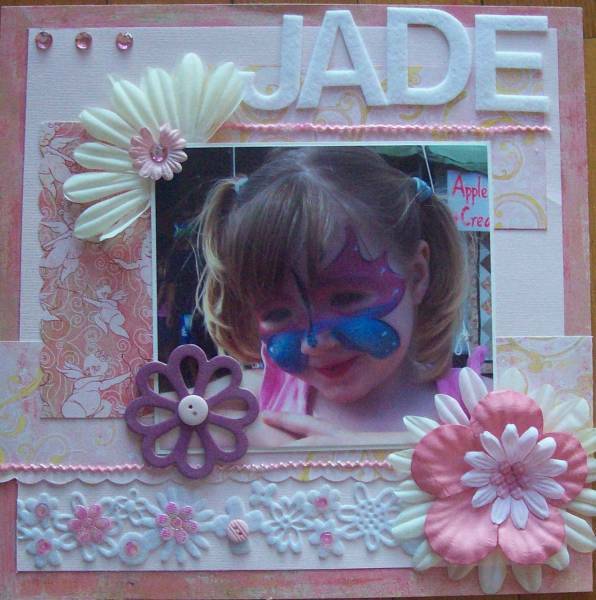 This is my page for the kit swap which I received from Mrs Muddle, thankyou again so much. I just love the paper. Amanda this is so beautiful.. the whole page is just stunning! I just love the way you've used the felt ribbon and flowers with the gorgeous photo and BG pps! It looks great Amanda..it took me ages to find a J in the bag of letters to make the word Jade for you, lol! you have done a lovely job. Ceci, you've put together such a gorgeous kit for Amanda and hasn't she done such a beautiful job with it. What a stunning LO! This is so beautifully soft and feminine. What a beautiful pack and a LO to do it justice! This is so soft and girly, especially with the cherubs and felt. Gorgeous LO Amanda! The delicate colours have been complemented with the soft texture of the felt and flowers. Nice work. Beautiful kit Ceci and I love how you've put it together Amanda, the flowers and bling look great. Wow, this is very cute.... love the bottom border.